But, for me at least, the most difficult thing about raising kids is that there’s nowhere to hide. I’m not just talking about how that idea called ‘privacy’ that you used to view as a fundamental human right no longer applies to you. Just today, as we shared a bathroom stall, my son asked me very politely, “May I please see your bottom to check if it’s different than mine?” Nope, nowhere to hide. But that’s not what I’m getting at. What I actually mean is that all of my character flaws are really, REALLY easy to spot under the almost all-seeing magnifying glasses of my children’s watchful eyes. So, if I want my kids to be kind, I have to be kind. If I want my kids to be generous, I have to be willing to share, too. If I want my kids to show others grace and mercy, I really need to be a merciful and gracious mom. And, because that’s not possible, and I make mistakes, and sometimes I’m unkind and selfish and punitive, I have to apologize and really honestly mean it. If I don’t, than I really can’t expect them to know what to do when they mess up in the completely understandably human ways that they will. There’s no getting away from it, people. 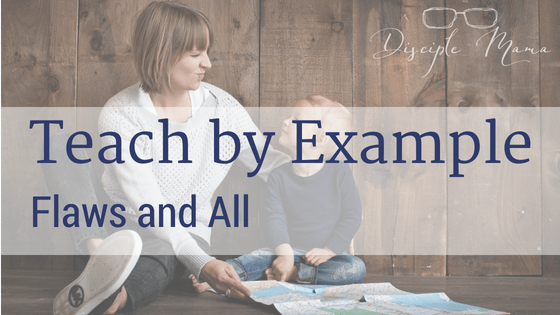 Are we really qualified to teach by example? When my heart was grieved and my spirit embittered, I was senseless and ignorant; I was a brute beast before you. Yet I am always with you; you hold me by my right hand. You guide me with your counsel, and afterward you will take me into glory. Whom have I in heaven but you? And earth has nothing I desire besides you. Can you relate to these words at all? Has your child been “grieved” or displayed an “embittered spirit?” Maybe your toddler has been a “brute beast” before you (tantrums, anybody?). But you’re there for your child anyway, right? You’re holding his hand and guiding her with your counsel because you want to lead them into success in this life and in Heaven! Well, our Heavenly Father wants to do the same for us (even if we are senseless or ignorant beasts, ourselves). So take your child’s hand in yours, slip your other hand into God’s, and follow His parenting lead. He’ll set the example for us, so we can teach by example: His! Our goal is to pursue closeness to God to the same extent that our children desire to be near us. Think about that the next time your kid won’t let you make a phone call, use the bathroom, or wash the dishes in peace. For more posts like this one, sign up for the Disciple Mama newsletter! This was so perfectly said! I have apologized more times than I can count! I do hope that my humble apologies are a good example for him! LOL. But I have always wanted my children to know that I was not perfect. No one can live up to those standards, and I do not want them thinking that they have to try. I want them to know and understand grace! Thank you so much for linking up @LiveLifeWell! We are so glad to have you! Yes! Perfection is such a two-edged sword…on the one hand, we are to be like Jesus, who was perfect. But on the other hand, we have all fallen short of that standard already, and it can be so harmful (for adults and kids alike) to continually live up to an unattainable standard. Thankfully?!? 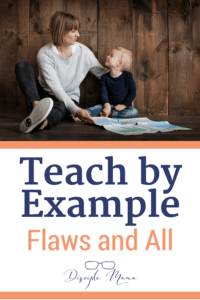 we can all easily model imperfection to our kids, so that the lesson they learn is not to try harder to be perfect, but to let Jesus be perfect FOR them and in their lives. This really hits home for me, because I feel like I fail at it so often. Currently, I feel like I’m in a particularly trying time because the failures seem to far outweigh the success. It is encouraging to know that we can never be qualified enough to be a good example. Yet I need to be better at taking both my child’s hand and Jesus’ hand on the day to day, ordinary moments of this whole parenting journey. Thank you for sharing with us at #LiveLifeWell. We all fail at this often, and that’s the beauty of doing it hand in hand with God, right?! Wow! You put all my feelings about parenting in words in this post. This was very encouraging for me. It made me cry a little…haha. Thank you! Aww! I’m glad you felt encouraged! God is great!